Anyone can get bored of Minecraft and not know what to build next. 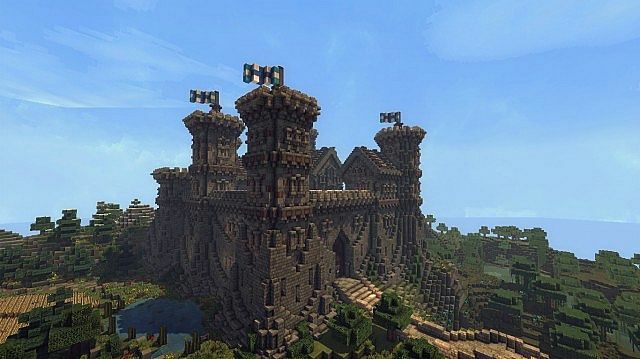 Thankfully, we have a list to give you some inspiration with 34 things to build in Minecraft. There’s so many cool things to build in Minecraft, from castles to more advanced ideas like penthouse suites or subway stations. To make sure you don’t get bored, pick a project that you will have fun building. You also want something that’s a little challenging, but not too challenging. Also keep in mind that if you are looking for things to build in Minecraft survival mode, you will have to get all the materials yourself. For really big projects like a skyscraper, you will have to do a lot of work to get all the blocks you need. Castles are a fun thing to build in Minecraft. Why? Medieval builds are popular and they also use simple materials like stone and wood which are easy to get. Castles can range from a small fortress with a few connected towers to a giant walled city. There is a lot you can add: a wooden gate, a water or lava moat with a bridge, fountains, gardens, and so on. Bonus: the walls and moat will keep mobs out of your base! I recommend starting small and adding on as you need more space. There are so many times where I started building a massive castle which ended up being too much work! You might get bored of Minecraft if you make your project too difficult. Building a mansion for yourself in Minecraft can be a lot of fun! Design your own bedroom, storage areas, hallways, grand staircases, and more. You can go one step further and build a fancy fence around your property and build a nice garden or fountain in front of your home. Feeling lazy? Consider finding a naturally generated woodland mansion and renovating it to your liking. Create a collection of buildings in a similar style and connect them with roads to make a town. For added protection, consider building walls to protect from creepers and other mobs. Some building styles to consider can include: medieval stone and wood, asian pagodas, or desert-themed with sandstone. If you are looking for cool things to build in Minecraft, a town can definitely keep you busy. I recommend starting small and then adding more and more things to build later on. A modern city with skyscrapers, paved roads, lamp posts, parks, and sidewalks is a huge project, but can be quite rewarding if you have a lot of time for building. There is a lot of repetitive building involved (for example, adding lots of floors to the same skyscraper) so it may not be the best thing to build in survival Minecraft. To make it easier, consider building on creative mode or using the worldedit plugin. Everyone needs a farm in Minecraft to grow your own food and supplies. You could make a simple farm with places for the essentials like trees and wheat, or a more fancy farm outdoors with a windmill and barn. Another option is to make an indoor or underground farm, but this will be more work. Gardens go well with almost any build: a town, the front of your house, or even just by itself. Consider using flowers, trees, gravel pathways, benches, and water. Fountains are a nice centerpiece for gardens. Google a photo of a famous landmark and use it as a reference for building something amazing in Minecraft. For example, famous castles like Neuschwanstein, the Eiffel tower, Big Ben, the Statue of Liberty, and so on. Hint: if you travel a lot, pick the favorite thing you saw on your travels. Fountains can be simple or large and complicated. They make a good decoration for gardens, castle courtyards, or even indoors. Consider using ‘steps’ for water to flow down and glowstone or glass within the water. Glowstone will make your fountain light up at night. Find a large underground ravine or carve out a huge hole with TnT then build a city underground. Put windows in the walls, hang vines, and have columns of water or lava. This one can be a lot of work, especially if you need to dig out larger areas for farms or growing trees. Pyramids are usually built in desert biomes using sandstone or sand. They are a nice place to put a beacon, and can be built in other biomes too using various materials. If you want to keep an Egyptian theme, decorate the outside with pools, columns, and sphinxes. Archways can be used as a grand entrance to a town, base, or other build. They are a fun thing to build and can be made of simple materials like stone or more luxurious materials like diamond or gold. They can be a big, impressive monument or they can be a smaller doorway to an area. Create a building decorated with bookcases, wood, red carpets, and stained glass, or even just a side-room in your base and make that your enchanting area. For extra fun, use pistons to make some hidden passages behind the bookcases. There are so many impressive churches and cathedrals in the world and building one in Minecraft can be quite challenging, especially in survival mode. However, they can make for a busy and satisfying project. For inspiration, find an image of a famous cathedral online for your reference as you build. Don’t forget the stained glass! Nether portals don’t need to be boring and there are so many different ways to design them. Make a decorated room just for your nether portal or make an even larger nether portal and decorate it (nether portals can be much larger than the standard small size). As an added bonus, keeping your nether portal in a separate room will keep away any mobs that walk through it. For building materials, I recommend using materials found in the nether such as quartz, netherrack, nether brick, or lava. Storage rooms are an important part of any Minecraft house. They can be large, very organized, and decorated. If you have the materials, use expensive blocks in your storage room to show off your wealth like gold, diamond, and emerald. Floating bases are not just for Skyblock, they can be a fun thing to build in survival Minecraft. Build a large platform for yourself up in the clouds, bring up some construction materials, and start building a base up there. Make sure you have a safe way to get down though, such as a jump to a pool of water, a ladder, or slime blocks to fall on. Sky bases make a good challenge for survival Minecraft. Build a village right on the water with wooden sidewalks connecting the buildings. You can also build boats out of wood as decoration for your docks. Docks make a relaxing place to go fishing as well (another thing to do when you’re bored of Minecraft). Find a jungle biome and build a base in the trees, or build your own giant tree with wood then build a base inside the tree. Watch out if fire spread is on though. It would only take one fireplace or mean player to burn down your entire build. Dig underground tunnels near your base and fill them with a little bit of water. Add iron fence gates or plants such as vines and lily pads for decoration. Hidden areas inside your sewers can add a sense of adventure to your build. You could also use underground tunnels to build a minecart subway system. Use rails to connect your different builds or to builds of other players on your server. Add ‘stops’ or ‘stations’ along the way with exits to the world above. Mazes can be made out of leaves and placed in a garden. They can also be made underground or inside buildings. For more fun, consider adding traps and surprises using pistons like drops, changing walls, and dispensers shooting arrows. Don’t forget the reward chest at the end of the maze. If you have an empty hallway inside your build, you can fill the space by building some statues. Make statues dedicated to your favorite items, mobs, animals, or players. Statues as shown in the photo also make a nice decoration for an entrance to your build. Is there a large river by your base? Build a fancy bridge to get across! Decorate the edges and supports for the bridge and add some lighting as well. Use nice materials like stone, brick, or wood instead of dirt and cobblestone. Your bridge can be as simple as a walkway or as grand as the Golden Gate bridge. A lighthouse in the distance glowing in the night is a cool decoration for any base. If you’re good with redstone, you can even make a piston-based system to make your lighthouse revolve with light. See this YouTube video for more information on a redstone lighthouse. Unfortunately if you build a boat you won’t be able to sail it yourself, but it does make for a good decoration on the water by your base. The boat can be made of wood and the sails made from wool. The boat can be as simple as a sailboat, or as large as a cruise liner with sleeping and dining cabins. 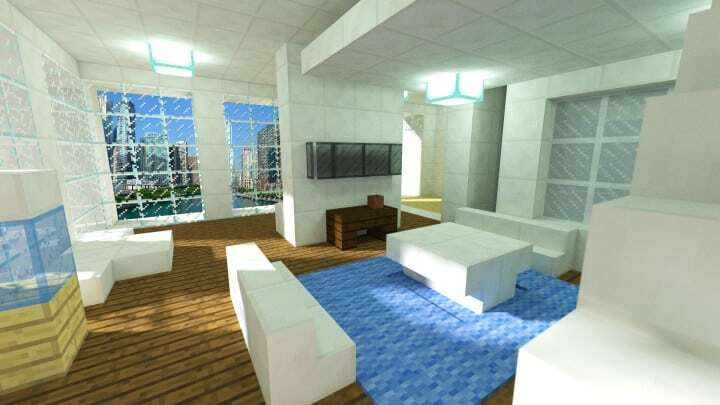 Make your home in the top of a skyscraper and watch your Minecraft world from above. This one might be a bit more work if you want a really tall skyscraper. Keep a modern design and draw inspiration from those New York TV shows with penthouses. Clock towers are a cool thing to build in any medieval themed town. They are very simple to build and are usually made from logs. Unfortunately, it won’t be able to tell you the time, but it’s a great decoration anyways. The vaults of a bank are a unique way to store your items in Minecraft. Build up a bank, and in the back, have an entrance to a vault area with your items. What better place to store your gold and diamonds than locked up in an underground vault? Make sure to use a strong material for your vault, I like to use obsidian. The guests for your town or base will need a place to eat and relax. Add a restaurant or tavern with a kitchen in the back and a seating area in the front. You can also have fun with it and create a fast-food restaurant like Subway or McDonalds. Build a large urban hospital for yourself and your visitors. Organize an emergency room, waiting area, and wards on the upper floors. If you want a smaller project, consider making a small clinic building for your town. I recommend building with whiter materials such as white wool or quartz to really make that red “H” or cross stand-out. Concrete would also be a good building material to use. Lay down the law on rule-breakers by building a courthouse. The inside should contain an area for people to watch the proceedings, and a front-area for the judge and the accused. Don’t forget to build a jail underground or attached to the courthouse. Prison servers are getting pretty popular on Minecraft, so why not build your own? Don’t forget the fence around the prison with the watch towers. 2-Dimensional art can be made in Minecraft just by using colored wool or other colored blocks like concrete. A cottage on lake or river is a nice and cozy place to build your home. You could make one just as a vacation house and connect it to your base with a road or minecart rail system. If it’s on the water, you’ll have a relaxing place to go fishing. And there you have it, 34 things to build in Minecraft! Do you have more suggestions to add? Leave a comment below. Thanks for the tip for these great builds, this will go great for my videos, I’ll be sure to link this down in the Bio of my next video. Thanks, do you have any other suggestions? Great ideas, my favorite oddly are castle and cottage (first and last) also liked the pixel art, did a calvin and hobbes myself, hobbes’ head is in the clouds so a bit too tall. The floating island gives me an idea; I’m gonna jumpstack above the clouds kinda near my base, build a well lit island and a nether portal so it will end up near my other portal, quick skip in the nether and I’m home.